We understand Simmer Pro won't work for everyone always. In addition to our 30-day refund policy customers can cancel any Simmer Pro or extension subscription. If you decide to cancel Simmer Pro your recipes will stay on your site until the plugin is removed. If you do not deactivate the plugin, recipes will appear on your site indefinitely where you can import them into a new recipe editor. If you deactivate the plugin, you will still be able to get your recipes directly from your database with the help of a developer. We have supported Simmer since 2014 and will continue investing in its future for many years. Support is an essential part of our offering and we keep our customers up-to-date on changes in advance so they can confidently use our plugin for the long term. 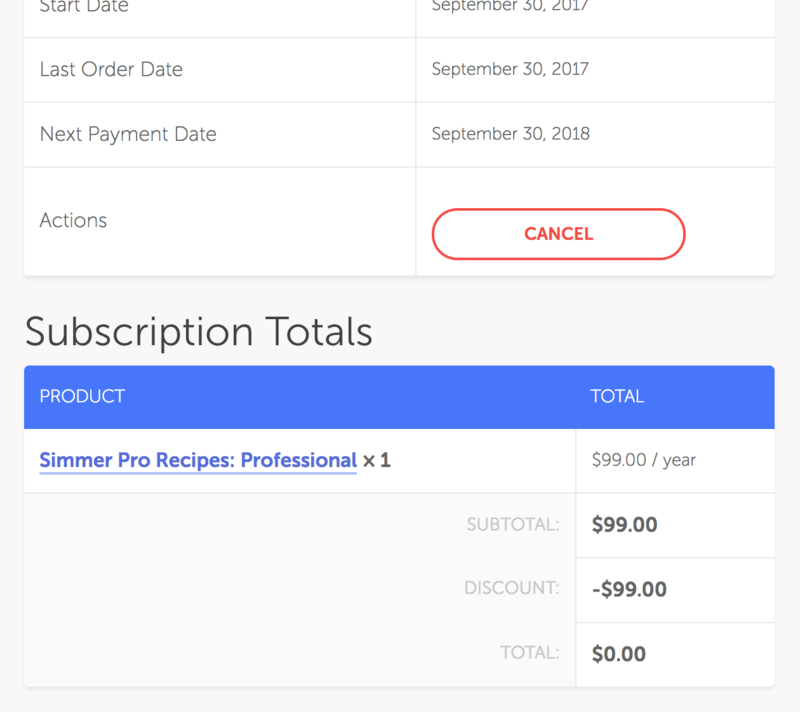 To cancel your Simmer Pro or any extensions, click View next to the order you want to remove from the Subscriptions section in your Simmer account. Then click the clearly marked Cancel button on the order page. When cancelled you will no longer be billed for any Simmer Pro keys for the cancelled order.